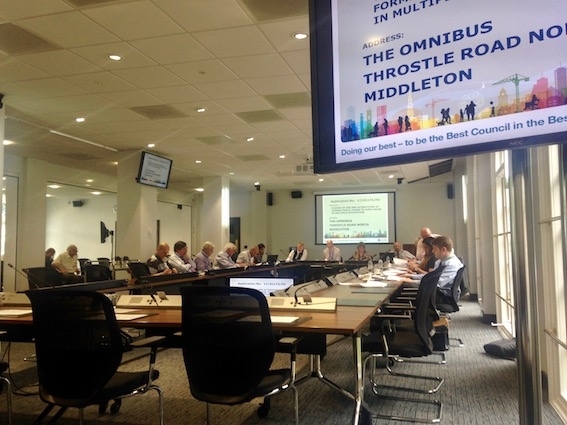 A meeting of the South and West Plans Panel met today (Thursday 6 July 2017) and rejected the revised plans from PCC (Yorkshire) Ltd to convert the former Omnibus pub into a House In Multiple Occupation (HMO). An application to create 15 flats on the site was rejected last year and the decision was upheld by a Planning Inspector on appeal. The revised plans were to create 9 larger en suite bedrooms with shared kitchen facilities on the premises. Planning officers recommended that approval should be given to the new plans. Beverley Schofield, speaking as a local resident and on behalf of the Sharp Lane Primary School community and other residents, argued that planning permission shouldn’t be approved. She described the owner as “unscrupulous” citing the disposal of building debris by burning on bonfire night and his refusal to attend any meetings with residents. They didn’t trust him to properly vet tenants to the development which is next to Sharp Lane Primary School. She said it wasn’t credible that young professionals would choose to live there as suggested and wanted to see positive development of houses on the site. Councillors David Congreve (Beeston & Holbeck), Patrick Davey (City & Hunslet) and Robert Finnegan (Morley North) all argued against the scheme saying it was too intensive, it was not sustainable and would adversely affect local residents. Officers raised concerns that if there was an appeal, it would have a good chance of success and that the Council could have to pay costs. However members voted overwhelmingly to reject the application and encouraged PCC (Yorkshire) Ltd to reconsider building houses on the whole site. “If he appeals we will keep fighting to the end” she added.